'The Lipstick Killer', smack across the front page!" 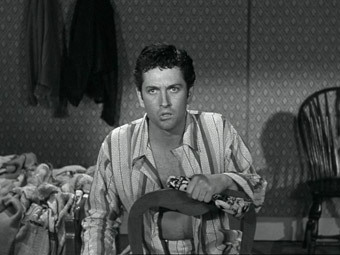 Despite a noir title that could have sprung up anywhere from the early 1940s to the late 1950s, the opening scene alone should be enough to locate While the City Sleeps in the later stage of this cycle, less for what it portrays – although that's definitely part of it – than the fact that it takes place before the main title. Earlier noir classics tended to start with the title, the credits and no-nonsense main theme. Only later did cinema get a real taste for dipping into the action before revealing the name of the film you'd paid to see. It's become popular with American television, of course, but this has less to do with structural choice than the perceived need to provide a seductive clip – known as a teaser – to dissuade you from switching channels during the commercial that immediately follows. But in cinema it's purely an artistic decision, and we were into the 60s before the technique really came into its own – do a net search for pre-credit sequences and see how many results have the words 'James Bond' in them. In the 1956 While the City Sleeps it acts as just the sort of hook that TV crime dramas would later make their own. Drug store delivery boy Robert Manners (a convincingly unhinged John Barrymore Jnr.) arrives at the door of a New York apartment of attractive young Judith Felton carrying her pre-paid order of bath salts. The door is answered by the building's elderly janitor, who accepts the delivery and closes the door. But a glimpse of Judy's shadow and the sound of her voice has a transforming effect on the leather-dressed Manners, and once the janitor leaves he's back at the door on the pretext of having delivered the wrong package. While Judy checks, he surreptitiously puts her door on the latch, using a lock mechanism of the like I've never encountered, but was doubtless popular in 50s America. Judy closes the door and heads for the bathroom, but moments later hears a noise and screams. Fade to black. Cue title. While the City Sleeps is a fascinating hybrid, an investigative thriller wedded to a serial killer movie and a drama of personal relationships and office politics. The workplace in question is the New York Sentinel, whose ageing and wealthy proprietor, Amos Kyne, dies just a few minutes in, leaving the business to his pampered son Walter (an appropriately oily Vincent Price in his pre-horror days). In the manner of new bosses (tell me about it), Walter sets about putting his own stamp on the company and creates a new executive post to be awarded to the reporter who tracks down the killer who is stalking the city. The three front runners are wire service chief Mark Loving (George Sanders), managing editor John Day Griffith (the ever-lovely Thomas Mitchell), and head of photographic services Harry Kritzer, who's having in a secret affair with Walter's wife Dorothy (Rhonda Fleming). 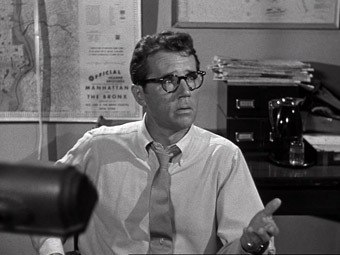 Their best reporter is Edward Mobley (a typically solid Dana Andrews), but he has little time for Walter's management style and no interest at all in getting the job, but is willing to use his sharp instincts and close friendship with investigating Lieutenant Burt Kaufman (Howard Duff) to help old hand Griffith to get one up on his self-centred rivals. The melding of genres is not in itself unusual, but in While the City Sleeps they initially play like separate components, individual stories with their own mood and style that only fully connect in the final act. 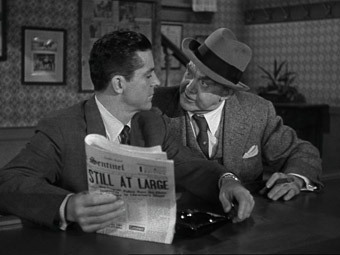 The unprincipled editor and newspaper office setting were familiar components in 1957, and Kyne and his brood are a lightweights compared to the yellow press scumbags in Five Star Final (1931) or the cynical vultures of His Girl Friday (1940). For all the claims made by the ambitious reporters – as the race heats up, Griffith assures Mobley, "to get the job I'll stick a knife in anyone I have to," before doing the decent thing and handing his scoop to Loving – they come across more as insensitive cads than ruthless cut-throats, encapsulated by George Sanders' pussycat drawl as the self-satisfied Mark Loving and 'Honest' Harry Kritzer's work-shy approach to the most basic of tasks. Even office sexpot Mildred Donner (a thoroughly alluring Ida Lupino) prefers charm and seduction to spite and drawn claws when chasing down titbits for her own unspecified column. Where the film really does feel ahead of its time is in its portrait of serial killer Robert Manners. While the City Sleeps was made four years before Psycho and a good many more before the serial killer sub-genre developed its own specific set of codes and conventions, yet they're on display here like they've been around for years. We've got a good looking young boy-next-door killer, an over-attentive mother, some childhood gender confusion, a tabloid-dubbed nickname, attractive young female victims, an escalation to murder from smaller crimes, and a thrill-driven upping of the risk factor on each kill. Manners is in every respect a thoroughly modern serial killer and poses a genuinely convincing threat, but for the first half is kept simmering on the narrative back burner until he can pose a more direct risk to those who are trying to find him. At a one point he even has the upper hand, as a maudlin Mobley, having just poured his heart out to to a scheming Mildred, is drunkenly unaware that the man he apologetically bumps into on his way out of the bar is the very killer that he and his colleagues are seeking. A top flight cast are all on fine form (Andrews does a great drunk) and are given plenty to work with in Hollywood veteran Casey Robinson's tightly structured and witty script, which was adapted from Charles Einstein's less poetically titled novel The Bloody Spur. Atmospherically shot by Ernest Laszlo (whose noir credits include D.O.A., Kiss Me Deadly and The Big Knife), it was the penultimate American film from director Fritz Lang before returning to Germany to direct his Indian Epic. Lang is at his most workmanlike here, focussed on character and story advancement, with none of the set-piece bravura of his earlier German greats (I really don't have to list them, do I? ), but still displaying a master's control of pace, performance, dialogue and tension. Despite claims to the contrary, Where the City Sleeps is no hard-boiled film noir nor a biting assault on newspaper ethics, at least next to the genre giants to which it will inevitably be compared. Its characters are too gentlemanly (and that includes the women – when Mobley sets his girlfriend Nancy up as bait for the killer, her response is not outrage but to stand by her man) and its digs at press ethics lack any real bite. But as a composite of elements it really delivers, the strengths of the individual components really paying off when they begin to overlap and interconnect. 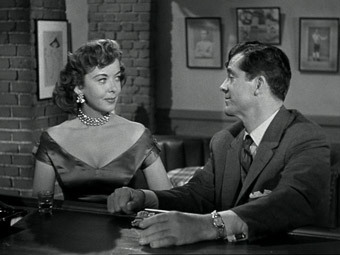 Consistently entertaining and occasionally quite tense (once Manners targets Nancy, the game is definitely upped), the film also takes a subtle delight in prodding the boundaries of the then still restrictive Hays Code, from some suggestive shadows and cigarette foreplay to Loving's reaction to the prospect having to work with the paper's second-rate crime reporter Meade – "How can I be sure of him?" he asks Mildred nervously, "Do I sleep with him?" And is it just me, or does that ageing media magnet, who hands the running of his influential newspaper and TV station over to his unpleasant and self-satisfied son, have a familiar and contemporary real-world ring? A solid enough transfer from a generally good original. There are a fair number of dusts spots still dotting the picture, but the tonal range is pleasing, the blacks are solid (if occasionally a tad aggressive), and the detail very good for a DVD transfer, though there are traces of mild image enhancement, which also emphasises the film grain in places. There are some quite large shifting vertical stripes visible on some sequences (the interrogation of the caretaker and its aftermath is a prime example) that look suspiciously like major print scratches that have undergone a less than subtle digital repair. The clean and damage-free Dolby 2.0 mono soundtrack has the expected range restrictions and some background hiss in quieter scenes, but the dialogue, effects and music are all clear and distortion free. A lively trailer that describes the film as "entertainment plus" and "the surprise hit of the year," which suggests, of course, the studio weren't expecting it to be that successful. The picture quality is pretty good, but caked in a hailstorm of scratches. A lot more substantial than you might expect for a film of its age, this is a rolling gallery set to music containing 50 posters, lobby cards, press clippings and ads and magazine covers for the film, all at a good size and quality. 23 high quality (well, the last one isn't, but it does have Lang in it) publicity stills in a rolling gallery. 37 very clear scans of press clippings about the film, including some intriguing tie-in promotions (free vacuum cleaners at screenings, anyone?). Unlike its predecessors, the slides here have to be manually advanced, which does give you more time to read them. Not quite the uncompromising newsroom drama suggested by its original publicity campaign (which included the tagline, "They'd sell out their own mothers! "), While the City Sleeps is still a solidly structured and consistent entertaining crossover film that lays a some crucial groundwork for the serial killer sub-genre yet to come. Exposure's DVD does well enough with the source material, and although the extras may seem a little basic, they're a lot better handled than most of this type.